Huancavelica is a city in Peru. 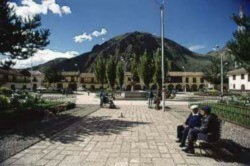 It is the capital of the Huancavelica region. It has a population of approximately 40,000, with indigenous people representing a major percentage of the population. It has an approximate altitude of 3600 meters; the climate is cold and dry between the months of February and August with a rainy season between September and January. Huancavelica is serviced by a train that runs between Huancavelica and Huancayo. This city was important to the silver mining operations of the Spanish colonial era. It provided the Mercury used to extract silver from ores from the Potosi silver mines in Upper Peru, now named Bolivia.